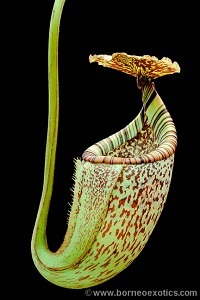 Fabulous species with green and red pitchers. Uppers are globose in the lower part becoming extremely constricted in the middle with a wide opening. Slow growing. From Kinabalu, Borneo. Seedling 2.5-3 cm in diameter. AVAILABLE !